If you are looking for customized industrial electrostatic oil mist collector made in China from a professional industrial electrostatic oil mist collector factory, please feel free to contact us. 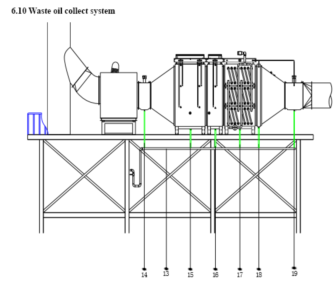 Note: ASG16KHAW-A00 is a multifunctional electrostatic waste oil collector which can be used for heat setting machine (stenter)/textile spining machine/dyeing & printing machines/PVC or PU production line/metal processing factories/synthetic leather production line/vinyl product production line/food treatment companies, etc. Note:Customer shall arrange facilities for rain & snow proof. An extra 4kw inverteris needed for the water pump. 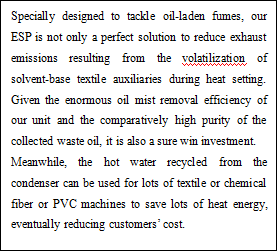 High temperature oil smoke (80~220 ) goes into reducer through exhaust pipe, a thermal detecting net in reducer works if there is fire in exhaust pipe and the fire fighting system works incase the equipment got fire. All the points above mentioned are waste oil collecting points.